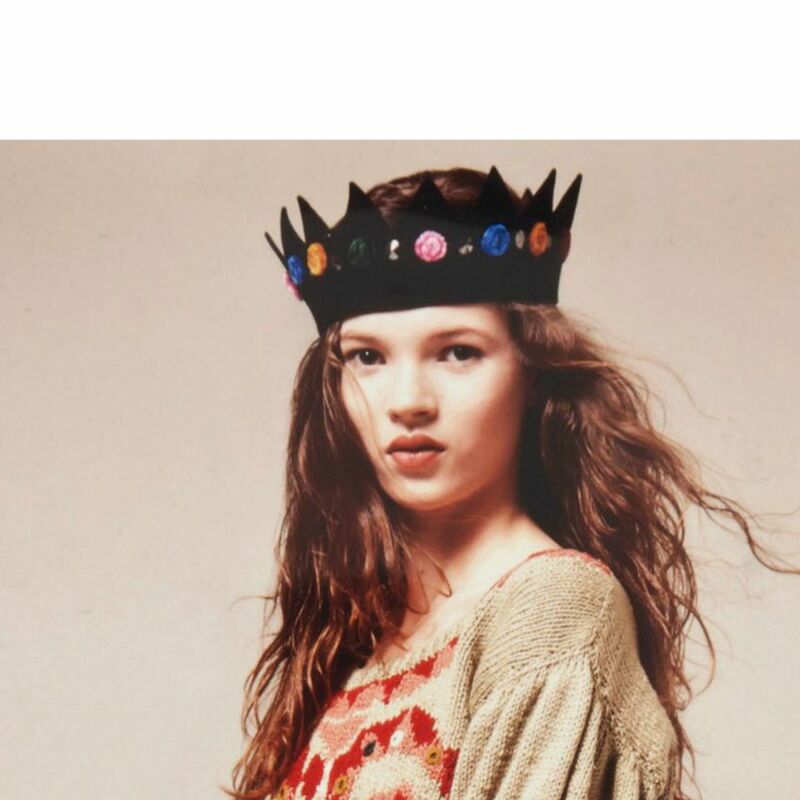 Kate Moss fans are about to have a chance to get one step closer to the queen of fashion: The iconic felt crown that the 41-year-old model wore on her first photo shoot, when she was just 14, is to be auctioned at Christie’s next month. With its sharp, triangular points, the crest resembles those paper crowns that are included in Party Poppers, or Max’s illustrated crown in Where the Wild Things Are. But this one’s made of thick, black felt and embellished with small mirrors and lake blue, cotton candy pink, emerald green, and orange fabric spirals. Moss wore the topper in a 1989 editorial shoot for i-D Magazine; it was her first gig after being discovered at JFK Airport by the founder of Storm Model Management. The photograph is of a very young Moss in a baggy novelty sweater, her hair thick and wavy beneath the crown and her bee-stung lips accentuated by a swipe of lipstick. The plum stain is the only hint of makeup on her face. Christie’s estimates that the crown, which was designed by Stephen Jones, will sell for between $7,750 and $12,400 when it’s auctioned on September 10. An unpublished photograph from the same photo shoot will be included with the price.